Monsoon Compact framed vertical stack modules are built with high-power laser diode bars to provide an extremely compact source of very high-intensity light up to multiple kW. Up to 36 stackable laser bars of 50-200W can be packaged together to provide modular flexibility to match the demanding application requirement. Monsoon stack modules are actively water cooled to enable low thermal resistance and high output power without sacrificing lifetime. 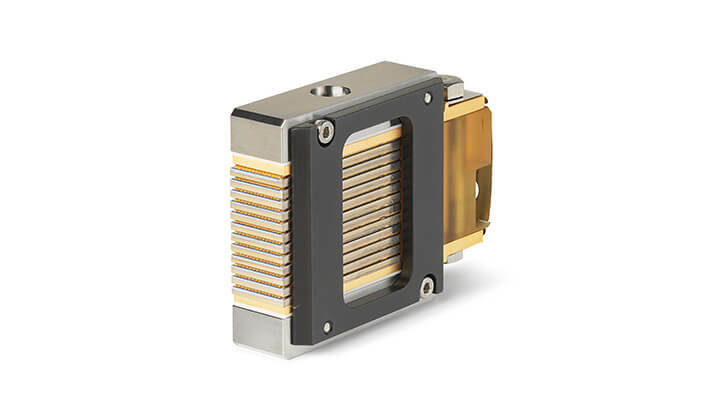 Standard product configurations include 12, 20 and 36 bars in a compact framed housing at 8xx, 9xx, 10xx, 14xx nm. Optionally, the vertical stack modules can be equipped with fast axis collimation (FAC) and slow axis collimation (SAC), as well as custom beam shaping. Customized packaging, configuration or wavelengths are also available upon request.